Last year I went to NYC for two reasons. First, Henrietta Hudson bar in Soho kindly held a fabulous fundraising event as I was in the midst of raising funds for my upcoming film SNAPSHOTS. Second, I went to Tribeca Film Festival to see the film AWOL starring Lola Kirke and Breeda Wool (directed by Deb Shoval) I was part of the producing team that brought AWOL to life so it was thrilling to see it on the big screen. Alison Bechdel is an American cartoonist. 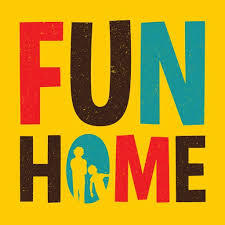 Originally best known for the long-running comic strip Dykes to Watch Out For, she came to critical and commercial success in 2006 with her graphic memoir Fun Home, which was subsequently adapted as a musical which won a Tony Award for Best Musical in 2015. (direct from Wikipedia). One night my wife and I decided to go to the theater and we saw FUN HOME. It had been highly recommended and we were warned to take Kleenex and enjoy. Ok. Well, FUN HOME definitely brought out the Kleenex, but it also brought out something else- every feeling I had when I wrestled with my own sexuality. It also brought out every feeling I had that there must be something wrong with me. Like the main character in FUN HOME, I too lived an emotionally imploded life for a very long time. Now don’t get me wrong, FUN HOME has wonderful music and so many touching moments. And there were so many people in the audience who chuckled and nodded when Allison has her big sexual awakening and likes it. Likes it so much that she becomes consumed with it. Watching Allison embrace her true self is a reason for Kleenex as well as cheering. Allison Bechdel is a 2014 recipient of the MacArthur “Genius” Award. She is also known for the Bechdel test, an indicator of gender bias in film. She has also been the cartoon voice of so many of us. Her books say what we think. Her cartoons are humorous but, like FUN HOME, they challenge us to think more, deeper, broader, longer. If you couldn’t tell yet, I’m a huge fan of Bechdel. In a way, she is one of the most important voices in the lesbian community. FUN HOME is currently at the Curran Theater in San Francisco. Don’t miss it. Oh, and stuff a few tissues in your pocket. Enjoy. Jan Miller Corran is a filmmaker and CEO of Three Women in a Box Films. Her next project begins filming in 2017.